"When I grow up, I want a house with one thousand storeys. Daddy will live in storey two. Mummy will live in storey three. Storey four is my store room. Storey five is my garden. Storey six is my balcony. My three girlfriends will live in storey seven, eight and nine and I will live in storey ten. I will rent the rest storeys to earn extra money..."
I laughed hearing my son saying these... Funny that these are what my four-years old son wish to achieve? Three girlfriends??? Geez! Another year has passed and my son is now FOUR! The transition from three to four hasn't been drastic for us and I can't help thinking that it seems like yesterday that my son had turned three. Being four now, my son seems more conversational and opinionated but still loves angry birds like what he did last year. Happy 4th birthday, son! 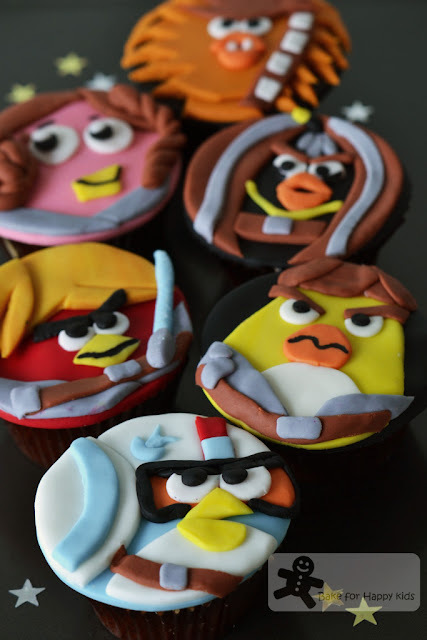 These star wars angry birds cupcakes are for you! May all your wishes (except for the three girlfriends one... LOL!) will all come true... Love ya! This recipe is super easy and always good. This white chocolate mud cake has been the most popular cake published by the Australian Women's Weekly. 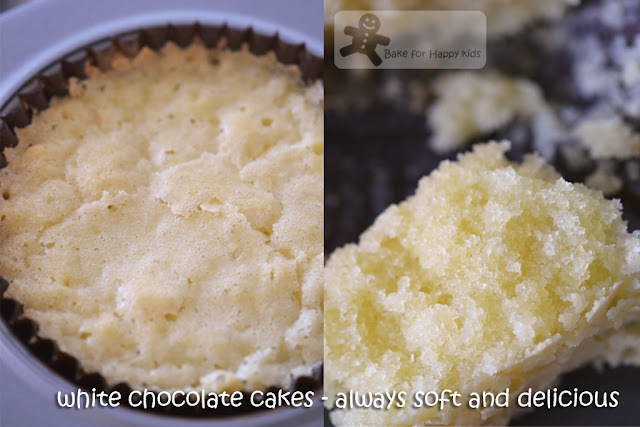 Due to its reliability, moist and delicious taste, I have used this recipe more than once but never blog on this recipe before and so, here I am using this super-easy-melt-and-mix recipe again to make these cupcakes. Preheat oven to 160°C (140°C fan-forced). Grease a deep 22cm-round cake pan; line base and side with baking paper. heat until smooth. Pour mixture into a large bowl; cool for 15 mins. 1 hour 45 mins. Cool cake in pan. Note: Using 2/3 of this recipe, I have baked 24 cupcakes at 140°C fan-forced for 35 mins. 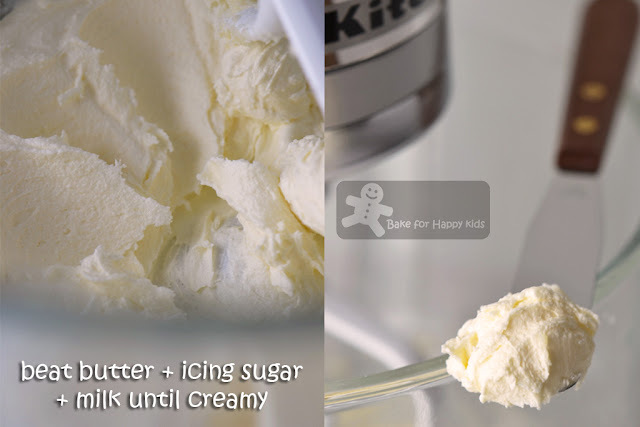 Beat butter with electric mixer until as white as possible. Gradually beat in half the sifted icing sugar, milk then remaining icing sugar. Please note that this amount is only sufficient to spread thin layer of butter cream on 18 cupcakes. Planning - Each cupcake design is sketched with the actual measurements of each Angry Bird or pig on paper. Using Wilton colouring gels, I coloured 2 packs (750g) of white rolled fondant into the amount required for these colours; red, pink, black, brown, light brown, yellow, orange, blue, beige and grey. Please note that this amount is sufficient enough to decorate 18 cupcakes and there will be excess of bits and pieces (about 300g-400g in total) of leftover. 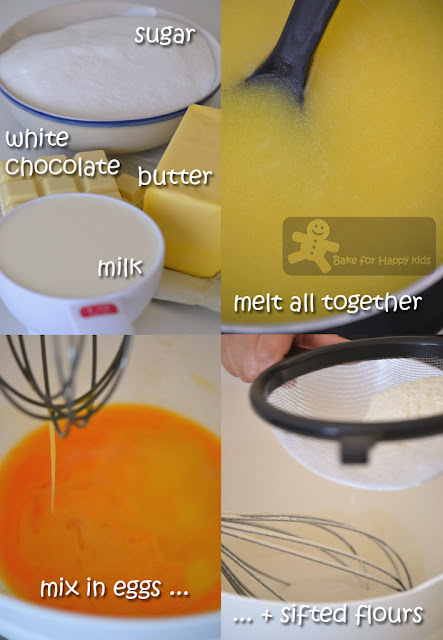 Spread a smooth layer of butter cream on the top of each cupcake. 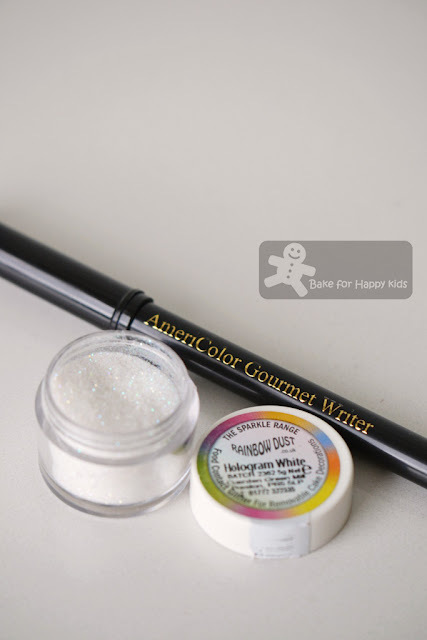 Roll out the fondant with a non-stick rolling pin with spacing rods to maintain a uniform thickness of about 4mm. 1) 6.8 cm diameter circles as faces or background of the Angry Birds and pig and carefully place the circles on top each cupcake. Luke Skywalker has a marble blend of yellow and light-brown coloured hair. Han Solo and Princess Leia has dark brown hair and Princess Leia's one has to be braided instead of cutting the shapes from rolled fondant. Chewbacca is quite furry and so the fondant edges don't have to be neatly cut. Obi Wan Kenobi has only 3 grey hairs. - LOL! 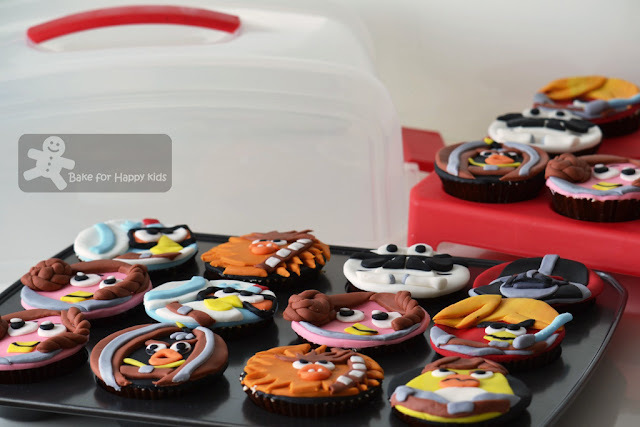 Assemble the Angry Birds' and pig's faces onto each cupcake using a paint brush to apply small amount of water onto the bottom of each cut-out shapes to adhere the shapes onto other fondant surfaces. Use an edible black food pen (Americolor) and edible rainbow dust to give the angry birds, pigs and Luke's swords a nice finishing touch. Please refer to my pictures or any Angry Birds or pigs pictures for assembly of the cupcakes. I must apologise that I can't provide any fine details further in term of writing as there is really too much to include if I have to list them all extremely-thoroughly. I reckon following the details with the help of these pictures seems much more easier than following the words in the lengthy instructions. Zoe, you are a master baker, Love that you made it beautiful with all the love. cake looks awesome and soft. Oh dear..These cookies are fantacstic! They look so good..just incredible! Happy birthday to your boy! These are adorable!!! What creativity!! Beautiful! Three girlfriends! Your boy is growing up fast, hah! hah! Very cute isn't he? Zoe, I am very impressed by your cupcakes. Very! I can see it took a lot of time and effort. Your son must have been thrilled! Zoe, your boy is so cute, he reminded me of my younger bro when he was about 4-5 yrs old, he said he wanna married to 10 wives and have 20 kids lol. It is so hard for me to choose which cupcake design I like the best, all are so pretty! Happy Birthday to your little prince. I laugh reading what your little 'R' said. These Gen X's imagination can really goes wild! All I can say is, WOW! lol. You did a great job with the cupcakes. They look so cute! Once upon a time, far far away, STOP! I like your Princess Leia & her hair! And happy birthday to your little prince! One more year then he will be going to school like Ethan guo guo! You are a great mum, Zoe! Zoe, you are super mommy! 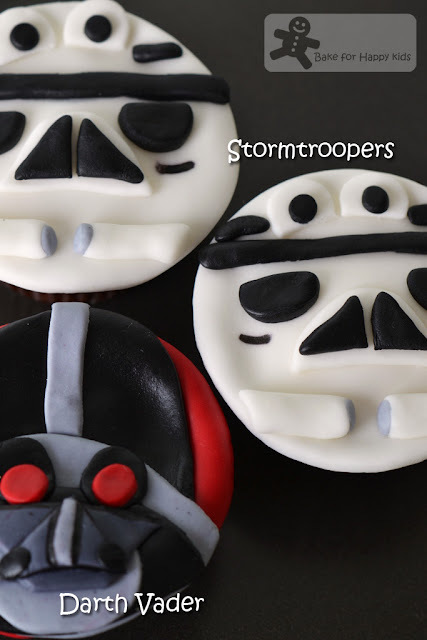 Your cupcakes are perfectly designed for the theme! Great job! Happy Birthday to your little boy! He is very cute! The cupcakes are beautiful! You did a super good job! wow!! this is really amazing!! 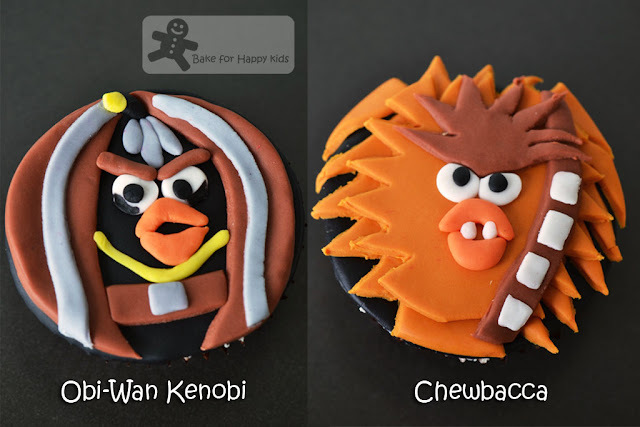 I love the angry birds star wars cupcakes. These Angry Birds Cupcakes are too beautiful to eat, Zoe. Happy birthday to your little boy!! Three girlfriends!! LOL:):) What an amazing out-of-the-world job you have done with these cupcakes..am so so impressed. And yes the white chocolate mud cake recipe definitely sounds like a keeper one !! Wow Zoe! I am very impressed with your angry bird cupcakes as much as with your son's comment! 3 girlfriends? He has great potential and speaks for all men! LOL! Oh wow! 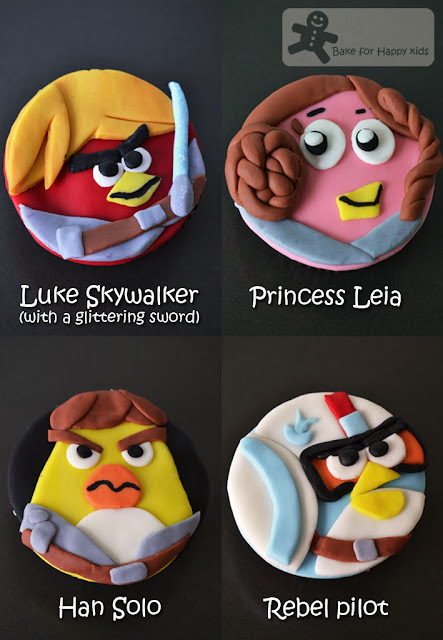 These Star Wars angry birds cupcakes are too cute! And your son is so cute, 3 girlfriends at 4 yr old??? So far my son hasn't indicated tht he wants any gf yet.. lol. Hi Zoe, I have been staring at your cupcakes for the longest time. It just keeping me smiling.... :))) Brilliant! Children are so honest about what they think-I love it. I love these angry bird cupcakes too. I know a few adults who love these cupcakes for their birthday too. wow! 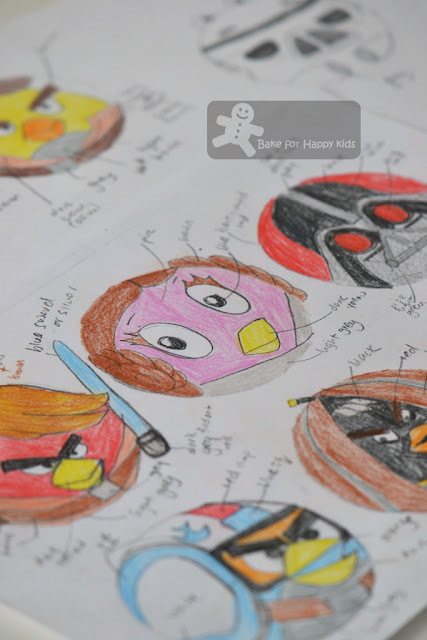 these angry birds meet star wars cuppies are awesome, zoe! your interpretation and meshing of the characters are so spot-on! i was actually laughing out loud while looking at them! i totally get luke, chewbacca, leia and the rebel fighter.. i must show my nephews this! you're amazing! ^^ it must have been the best birthday ever for your son ^^ happy birthday! Hi Zoe, amazing baking skills you have there! thanks for leaving me a comment... I'm so amazed by the stuffs you bake - truly baking queen! will have to learn from you... you are not on my reading list and hopefully one day I can bake like you do! Zoe, Happy belated birthday to your little prince!!!! Very creative and amazing cupcakes!!!! !Many Thumbs up to you and your kids!!!! OMG...three girlfriends??! Your son is very much like my nephew who says he loves 3 girls from his class! LOL. And he loves angry birds too! I'm sure that like me, he will find those cupcakes adorable! You are so creative, Zoe! I know this was not easy from the sketch till final products , a lot of effort you have to put in. Your son is lucky to have you Zoe. Oh my word, Zoe, you're so patient and so talented. Really cool looking cupcakes for a cute 4-year old with BIG dreams!!! :-D Happy belated birthday to your boy, and continue sharing your baking ideas. Sono bellissime ..complimenti e buona serata. Sure your son will love those angry birds cupcakes that your make for his birthday. Will love you even more. You have put a lot of efforts in making it. Well done. Your son is so adorable. At least you know that he's interested in girls rather than boys.. lol. He is very lucky to have such a creative and artistic mom! Love all your angry bird cupcake creations, Zoe. Great job! These are wonderful! Very creative, and a great job. Happy birthday to your son! Love the story about his dream house! Very fun stuff - thanks. They are sooo cute!Very impressive cupcakes!You are an artist,dear Zoe!Kisses! These are incredible! The detail is fantastic... very impressive! Zoe these are amazing! Im impressed! You're amazing! I'm a big fan of Star Wars. This is just great! Admire your efforts for these... they looked awesome! !